We often hear people say "I'm not a cat person" and then we learn they NEVER had a cat of their own. Their decisions are often based on the cat of a friend, relative, neighbor. Sure some cats are distant (the scaredy cat) or aloof. And some even protective. For some reason the world is amiss that cats come in all shapes, sizes and personalities! Many cats exhibit "friendly dog gestures" and will greet you (expecting a treat), roll on their backs exposing their belly inviting you to scratch their tub of love...Some you have to earn their respect before they welcome you into their inner sanctum. Heard the expression, "Dogs think they're human, Cats think they're God" there's a lot of truth in jest. Then there is the macho thing. It's bad enough when men say "you'll never see me with a toy dog" yet if a future girlfriend has one, the boyfriends are more invested in the dog than the girl. 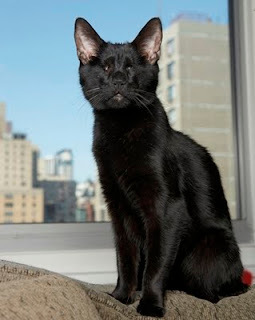 (Remember the story of Homer, the blind black cat where the guys were still interested in playing with Homer after breaking up with the mother)? But when a guy looks at you like an alien for having 3 or more cats, suddenly having a toy chihuahua is not so foreign to them. And they say women don't know what they want! It really boils down to ignorance, or more diplomatically stated "lack of knowledge". But we think for men it's mostly about insecurity. But that's just our nonexpert opinion. Well we came across this great story of a converted man, Keith Phillips who never had a cat and now has three cats, works with therapy cat, and helps spreads the message of the need to spay/neuter and educates about stray cats. Read Keith's story on cat blog "I Have Cat". Our fellow blogger, Tamar, is a single girl living in NYC with two cats and writes an entertaining blog, "I Have Cat" about being single, dating and having two cats (piece of cake in our opinion--try having more than 3! That's complicated). Keith was a guest writer for this enlightening post about men and cats. Click on the link below to read about Catman Keith! And men? We bet there's a kitty lover within you. I have a dream...Join Me! I have a dream that one day we will reverse the rate of homeless pets and animals nationwide. In Miami Dade County we are facing an epidemic rate of 400,000 dogs and cats without home, without shelter, trying to survive. If dogs and cats are man's best friend, then why do we discard them like disposable items? A record number of 37,000 unwanted pets were dropped off at the county shelter. The facility is overwhelmed. One day I came to a realization, an irony, and it hit me harder than raining cats and dogs. THERE IS A SOLUTION! Yes, the solution, the cure exists!!! The problem? There is little to zero awareness. I think of all the other causes that have high visibility and awareness. Breast cancer is a prime example. October is Breast Cancer Awareness Month and the pink ribbon is nationally and easily recognized. The myriad events from 5K walks, 5K runs, galas...Regular news reports encouraging women to get annual mammograms and conduct self breast examination to prevent the onslaught of cancer. Yet a billion dollars has poured into cancer research and we still don't have a cure. Have you ever heard of a crisis lingering where the cure exists? It is the case of homeless animals. Sounds like a tragedy. It is. For me personally, it's pure frustration and is void of all common sense, even humanity. 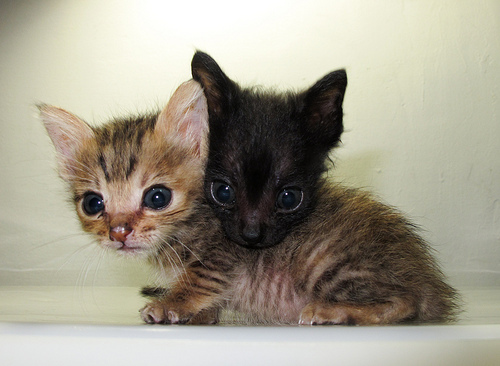 In South Florida there are a number of veterinarian clinics that offer low cost spaying/neutering to slow down the homeless cat and dog population. There are even free programs for those that are unemployed or on welfare and want to make a difference. There is ZERO AWARENESS! Why? The subject of homeless dogs, especially cats, is plagued with misconceptions. There is so much educating required. But it's possible. A well planned PR/education campaign with both offline and online tactics would have a tremendous impact. we don't need to spend billions of dollars!!! With residents, government, media, and ad agencies working together, the impact could be immediate. Imagine that! But our country needs a national spokesperson to rally key players and spark the hearts and minds of American residents. If we are a nation of "animal lovers", then it's time we showed it. I'm dreaming of the possibilities. The first person that immediately comes to mind is Betty White, an animal advocate. She's more popular than ever and respected by all ages. Does anyone have connections to her, her agent, her PR agent, TV Land? I witness so many "soldiers" in the trenches--trapping cats, getting them spayed/neutered, caring for them post surgery, feeding colonies...but it's a vicious cycle that never ends. TNR (Trap-Neuter-Return) does work to a point. We can not just tackle the surface problem. We HAVE to get to the ROOT OF THE PROBLEM. And that is education. If you would like to become part of my Think Tank for OPERATION BAST to end homeless animal population, please contact me, Christine Michaels at riverfrontcats@yahoo.com. You can live anywhere in the United States. We will leverage technology for conferencing via SKYPE, and phone to communicate and launch our plan! Everyone has something to offer. Whether it's ideas, whether you're good at schmoozing on the phone, a strong copy writer, a strong PR writer, connections with local officials, state government, even the White House. Even better, connections to highly visible celebrities. So many organizations are tackling this on their own. Let's create SYNERGY nationwide and reverse homeless pet population! I have a dream and I plan to fulfill it, somehow, someway! Do you dare to do more than dream? Note: Bast is the name of the ancient Egyptian goddess, a female black cat. She was adored, revered and respected. Black cats are considered good luck in other countries except the US. Looking for a light-hearted book with a solid story and life lessons to learn? Well I have just the book recommendation! Pick up Homer's Odyssey. Now while this book is about a cat, PLEASE KNOW, this book is really for people who do NOT have cats or say "I'm not a cat person". On the surface while Homer's Odyssey is a non-stop adventure describing antics of one cool cat, and dispels all the myths about cats but on a deeper level, it speaks to prejudices based on looks and color and disability. Not only are black cats the least adopted and the most euthanized in shelters, this cat was blind and considered a "special needs" cat. Immediately the word "disability" and "special needs" conjures up images of additional care, vet costs, obstacles followed by more obstacles. A slew of more negative stereotypes continue to stream. Thanks to the author and other high profile celebrities, I have learned they bring greater joy than expected. Children and pets with special needs often have other special gifts and remind us not to take simple routines, little things for granted. A walk in a park, listening to the radio, playing a simple game, a family sitting around the dinner table and sharing their day...How often do we appreciate these acts? Even more inspiring are the people that accept these "special needs" children and pets. Moreso, they embrace them when most would reject and abort them. They are all heroes in my opinion. It's about facing a difficult situation head on, EMBRACING IT and become stronger and more fulfilled! Gwen Cooper, the author, was a single female struggling in her career and also finances. Already strapped with two cats, she feared a third cat, much less a blind cat, would label her the "crazy cat lady" and dig her deeper into a dark financial hole. But that black cat brought light, laughter and love! Of course Homer owes his life to a young, altruistic veterinarian, Dr. Patty Khuly, who surgically removed his eyes due to severe infection and turned to her client Gwen Cooper in hopes she would adopt him. Homer's story is one of a Wonder Cat who is blind but has no fear. Even the guys that Gwen dated and broke up with, returned just to visit Homer, the cat! He even chased away an intruder in the middle of the night. Homer also teaches Gwen that love is not something you see with your eyes. Unlike most books about pets, I promise you there is no sad ending. Gwen Cooper is a gifted writer and keeps the action flowing and you will laugh all the way through! Order your COPY NOW! Click the link below to order your copy and a small proceed benefits Riverfront Cats! Congress could learn a lot about bipartisanship from this kitten and pitbull. They can playfight and get along and playfight then sleep together and compromise...In the end they get along. Watch the video! You will love it!